The joy and sense of fun that is the Wellington Waterfront never ceases to amaze me. Today in the local paper, an expose is made on a number of new / newly released projects for the waterfront, of which I just can’t ignore. Entitled, perhaps a little too zoomorphicaly, “Is that toilet a crayfish or an aardvark?“, the Dom Post unveils attention on a number of brand new proposed features. Some of them we’ve heard about before, like the WhareWaka, which appears to have a new plan and a new articulated skin (shown below). It looks articulated, with a series of triangulated panels making up a hardened carapace. Some time ago there were two buildings planned for there, neither of them filling me much with joy, but this one looks far more interesting, and despite the low quality render, looks like it may sit well against the Star Boating Club buildings as well. I’m gunning more for hermit crab or barnacle. Intriguingly, the paper says that “The design was the winning entry from a competition held between 30 young designers from the Studio of Pacific Architecture.” So that’s what they get up to in their secret lofty offices! There’s also some tosh from some of the council about how the building is or isn’t like Hundertwasser’s tiled toilet ediface at Kawakawa, but that’s all pretty irrelevant. Kawakawa is so small that it has only one thing going for it – actually, normally a bus full of Japanese tourists going for it with cameras, which make it very difficult to find a place to pee: whereas this orange-hued wee timorous beastie will just be one of our many things to intreat you to walk along the waterfront. Other projects also intrigue me. 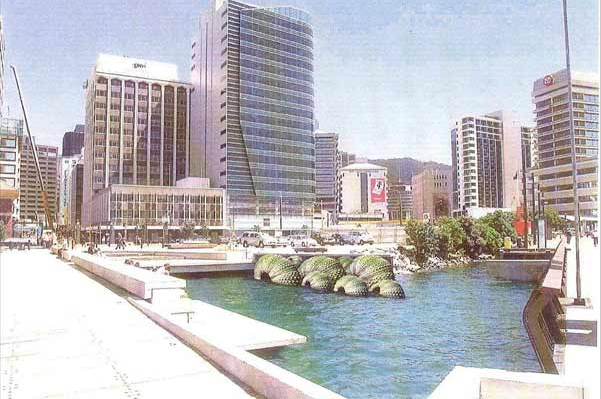 A Michael Tuffery sculpture of giant kina rising to the surface is proposed to sit submerged near the new bridge at Kumutoto, while a starlit ice-skating rink is proposed for under the sails at Queens Wharf. We’re spoiled – Auckland is still trying to come up with one good idea for its waterfront, while we’re going for an extra ten or so. 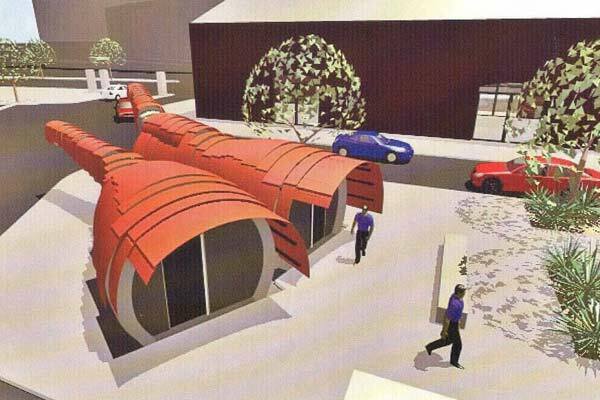 There’s a “proposed building” made of an assembly of containers for the Maritime Police – aimed for their site near the old Ferry Building, and a giant inflatable market stall to possibly take the place of the buildings at Waitangi Park, until someone fronts up with the cash to build those. That’s a great idea – it’s bitterly cold down there at the market on the weekend, and a groovy looking inflatable building would be fun. There was one erected temporarily there a few years back for one of the International Festival of the Arts – and it transformed the city with it’s vast white wobbly body, like a giant beached whale perhaps. What an incredibly vibrant city we live in. I love it. Wow – all these treats and not a single high rise among them. What a surprise that WWL have come up with some stuff to extend their hands in the pockets of ratepayers existence. Just a few questions though. Will an outdoor skating rink on Queen’s Wharf work in Wellington? Its hardly like Mannorburn where the hardy deep south types rug themselves up for a family day of fun. If Shed 1 is used for a rink to give substance to Kerry’s promise, will its current business house users have the extra out of office time to migrate to Waitangi Park during their busy workdays? If not, the bubble could well become an inflated white elephant? Michael Tuffery’s sculpture of giant kina looks great – will kids (big and small) be able to climb over the sculpture or will the OSH types insist on an ugly security fence around it? You would think that something as cool and vibrant as new public toilets at Kumototo would be an open competition. Imagine the designs that could have been produced. Instead there is an internal competition within StudPac, between 30 young designers. I like the Michael Tuffery sculpture though. Aside from the studio pacific entry, who is coming up with these proposals? They all seem very out of the blue. Perhaps if the outer T ideas competition had been extended to the entirety of the waterfront we could have got some interesting public entries to bounce off against those the council is suggesting. Anyone have any info on the cladding for the toilets? Copper? Cor-ten? Would also be curious to know what the ‘tails’ contain. Also is there something in the Studio Pacific presentation process where their designs are pitched based on their mimetic potential? Or is that just something that the council/airport tack on as a way to sell the proposal to the public? If you have a look back at wellurban you will see that the option was selected as far back as July ’07, it was basically a case of convincing WWL to actually get round to funding it. good. i like the containers. Phiip – the new proposals appear to have been a successful last ditch effort so that WWL could extend its tenure. Pity the board and employees didn’t just go out and get real jobs instead of engineering a way to keep their hands in the pockets of the ratepayers. The one consolation is that the rash of schemes suggests a diversion from flogging off the waterfront to providing public facilities. See http://www.stuff.co.nz/dominion-post/opinion/2833667/Its-time-for-the-tide-to-turn-on-the-waterfront for an interesting read. Yes I read that article too and I have to say I think she is as mad as a meat axe. Her article is just total histrionics rubbish. There is no wall of buildings proposed. Why doesn’t she read what is being proposed today and then comment? and I love the kina. Max, I absolutely concur. Cr Ritchie comes across as anti-everything, and if she had her way, Welly would be forced to sprawl like Auckland. I think it is precisely because we have WWL that we are getting such high quality environments such as the lagoon and the Kumutoto area and Waitangi Park. WWL know their limitations, and encourage what seems to be the best of the various design teams in Wellington and aim for a quality level considerably higher than I think we would get if this was just left up to the Council directly. The various little projects that WCC do themselves have so far been, shall we say, mostly less than meritorious. Full marks to WWL and long may they continue. Alan – seem to recall that WWL got smacked over what they had intended for Waitangi Park. I’m not sure which version of Kumutoto you are referring to, but selling out to the high rise aspirations of developers doesn’t seem to be getting the big tick from the general public. As I understand it, TAG are responsible for the final architectural and landscape designs and advise the Council, so they are responsible for the final presentation, not WWL. But WWL make the design decisions Peter. They choose the architects / designers and brief them. It is up to TAG in an advisory role to ensure that design quality is met. They advise only. And there are no high rise aspirations of developers. That is Helen Ritchie scaremongering. As DeepRed says above she is “anti-everything” and a nut-bar. The DomPost should have allowed a balanced opinion, maybe in the form of an Ian Pike commentary. Peter – good points, but I’m talking just about what is there, built, now. Which is all good in my book. Mobsta – from what I have read of your stuff on Eye of the Fish, you and an admin assistant could easily do what the 7 board members and ten staff at WWL do. How hard can it be to seek ideas and opinions then farm the design stuff out to experts, knowing that TAG will only give a sign-off if required standards are met. Not sure about your logic Honeywell. It seems you are saying that the only way the public can have open space on the waterfront is by selling or leasing most of it on favourable terms to developers. We can safely pass off the ground floor access as a crock of….. Even Ian Athfield has said publicly that it doesn’t work (Variation 11 hearing) and that more flexibility is needed to close spaces off – that’s if you could categorise ground floors as open space. Going through the figures in the the Policy and Strategy Committee minutes, it seems the ratepayers are forking out about $5 million annually for the waterfront, along with millions being loaned to WWL by the council that I gather goes in part to rent holidays and subsidies for the waterfront’s failing commercial ventures with the expectation that future developments furnish income. Now add to that the income from ex-harbour board land that should have gone into developing the waterfront and one has to wonder why there isn’t any money for a few modest improvements that no doubt would also generate some income like the easy money car parking returns. Interesting that most of – well, ok: all of the hoo-hah is taking place only over the proposed toilets. There are a whole bunch of other things proposed, as outlined above – but I guess the DomPost has made a big thing out of the cost of the loos, and so people are only picking up on that. Some of the comments on the Stuff website are great though – and I’ll just reproduce some of them here before they disappear into the ether…. Please, please make this go away. Why is there a Kiwi obsession with making public toilets ‘architecture’? They’re a necessity, but there is no need to make a feature of them. To be spending this amount of public money on frivolous things such as this is madness. I wonder if there is a mates’ club of architects and local government officials who allow this rubbish to come to fruition. The extensions (claws, feelers whatever?) on the loo look as though they could be sculptural waste pipes but don’t terminate in discharges over the harbour. Now that would be an attraction for camera clicking tourists – a loo AND a waterfall. This must be an oversight since Cr. Stephanie Cook seems to think the waste should end up in the harbour anyway via a cheap long-drop. Orsum torluts aye! I rickin they’re swit as! 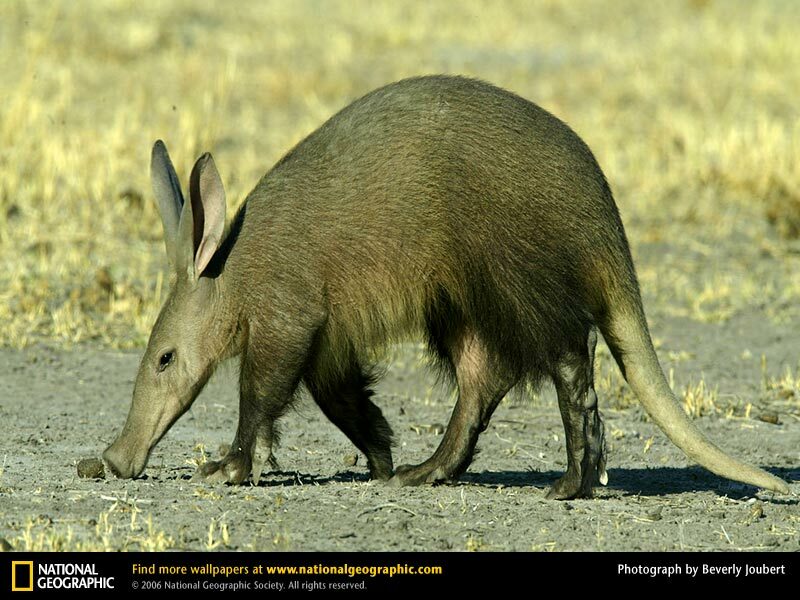 I think the author means ‘is that a crayfish or an armadillo?’ aardvarks are furry. This is almost as bad as the two mouldy camel balls they thought up for the new Wellington Airport. You already have the beehive, one ugly building is enough isn’t it? 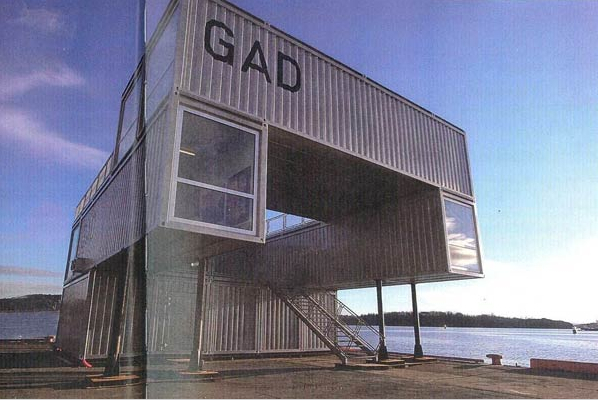 Would you all rather some ugly squat breeze block structure sat smack bang in the middle of the waterfront? No thanks. Has anyone actually asked how much more these would cost than the standard (ugly) super-loos we have? My guess is not a lot more as it mostly looks to be cladding around a standard loo block. Public loos cost a lot more than you think. Absolutely brilliant – we need innovation and design in Wellington – especially to enhance our magical waterfront space! WCC – don’t listen to the sour comments – a vocal minority relish complaining about anything innovative or creative. Long live the vision!! There’s going to have to be some kind of building created for the toilets, and considering the location they need to be something special, like this. They are great! The last thing we need is boring concrete slum-like buildings on the waterfront. It’s important to invest in the most significant city tourist area. Responses to DomPost article “Slump forces Wellington waterfront rethink” (http://www.stuff.co.nz/dominion-post/local/2820023/Slump-forces-Wellington-waterfront-rethink) may hearten you Maximus. the police container building strikes me as one which looks superb in a frank lloyd wright kind of way on paper, but i imagine it’s going to look like a pile of rusty crates when its seen in the flesh… the kina on the other hand are somewhat unique and i imagine will look better as they age and get a coating of algae of their own. 1. You kind of think they missed a trick in the first place if you build a new public space and dont provide any public amenties as part of that mixed metaphor that is the meridian building…? 2. The orange testicles are very simlar to another project in wellington do you think we could use something other than copy paste scale and rotate…? 3. Dont build something jsut for the sake of building something its plain dumb, all it does is set up something the constrict future ideas. 4. I bet watefront watch are happy simgle storey blips..long live the bland. 5. On the flip side the Kina are cool at least they addres the conection between the site and the sea. Angry Dad – Scary Name! I thought I had been caught out by my father for not providing a suitable Father’s Day present – thanks for the reminder. But a couple of things – there are 3 cafe / restaurants in the Meridian building, and it is easy enough to use their loos if you need to. During the day time only, obviously, although the restaurants have quite long hours and so do provide a good WC service, so to speak. The orange testicles, as you put it, are very very different from the orange pumkins, if my sources and understanding are correct. For a start, the pumpkins are clad in copper, and so will end up being green or brown, but the testicles are possibly steel, and therefore probably painted. The services for the new 24 hour public loos are apparently all in place below the ground. Do you think we could get away from discussing those bloody toilets for a minute? For instance – the Whare Waka? It’s vastly different from before. And now it is one building, rather than 2 as it was before. So something drastic has happened there in a po0litical sense. But I’m intrigued in the roof. It looks as though it is meant to concertina, to fold up, make itself an origami or even perhaps to wriggle. Which seems odd, given that it has a body full of long straight canoes, and a head like a whare whakairo. Its so much more interesting thanthe loos! Does anyway know who is responsible for the design of the Whare Waka? It seems vary different and I can see a lot of spark about the overall form, particularly the triangulated roof. However, Im curious on the intentions of the interior space in relation to the porch and how the two realms interact with the programme…. 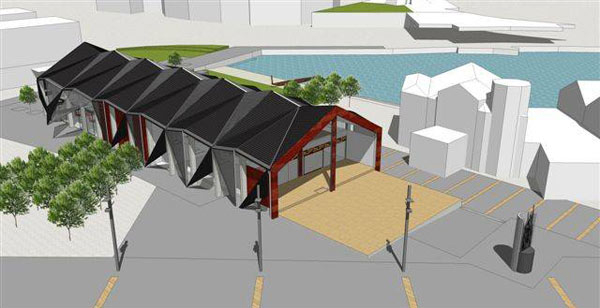 The Whare Waka was previously designed by Architecture Plus – in the old version. Not sure if this one is or not. Indeed, the triangulated roof form is intriguing – almost as if it is to curve, or move, or fold up and pack away. Although, one hopes, not with the waka still in it…. “After waiting many years, Wellington Waterfront finally held the long awaited Competition for the Outer Tee. We�ve been holding our breath, waiting to hear what the results of the competition were. How many entries? Any good ideas? Was there an outright winner? Could the judges make up their minds? But since the entry period closed, nothing but Silence. Perhaps we should shell out for an official information act request and publish them on the Fish. That is assuming OI can apply to local government…. We’re not alone in the current fascination for toilets. Follow this link for a story from the UK – an official RIBA Loo competition no less…. makes this crusty loo look quite straightforward…. “Ice skating rink, Queens Wharf, beside TSB Arena, during winter months. – to which of course, one has to ask Mr Gardyne, what does a toilet have to look like? But Katy Brown, from Kilbirnie, said in her submission that waterfront projects would add to the city’s carbon footprint and the council should consider what she calls “a recreational forest”. – prepare a business case to demonstrate the financial viability of a proposed ice skating rink at Queens Wharf and tensile fabric structure next to Waitangi Park, and complete the planning and design of these projects. – address design issues and explore how to reduce the estimated $400,000 cost of public toilets at Kumutoto, and review the signage and condition of existing toilet facilities on the waterfront.